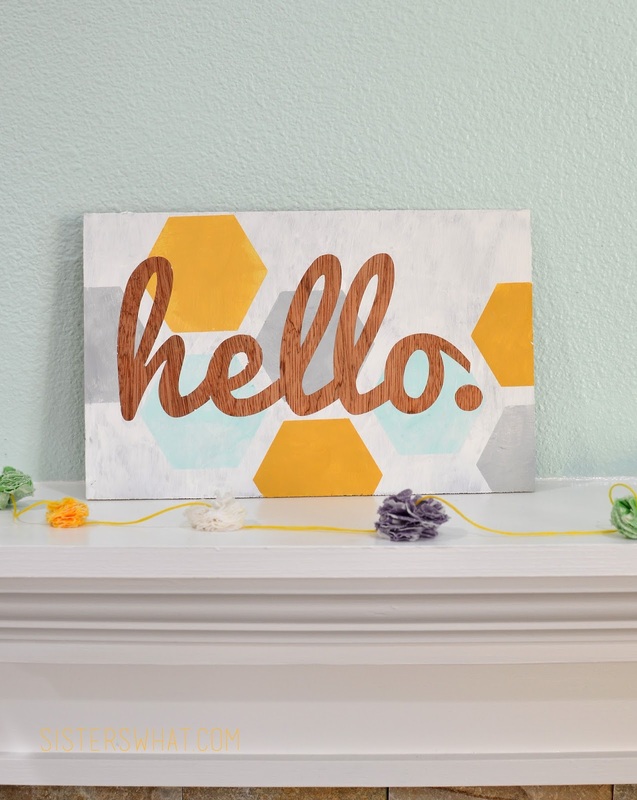 ' DIY hexagon hello sign - Sisters, What! 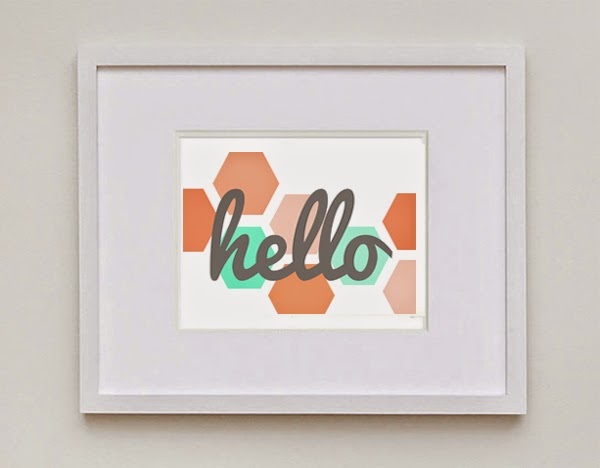 I recently saw this hello sign at Snap Creativity and just fell in love with it. 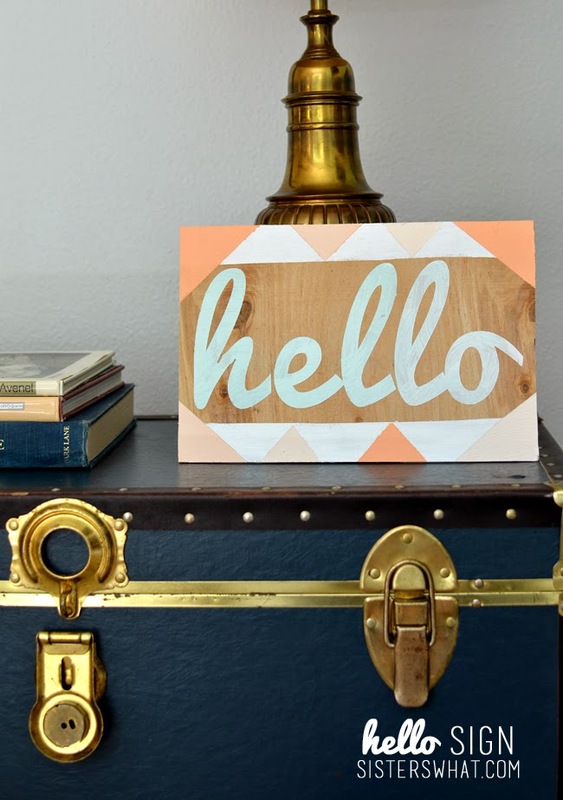 We needed something new for the door and nothing says hello better than a hello sign. I mean this sign is literally saying hello. Anyway, I had really fun making it. I recently have been loving the shapes trend and hexagons have been calling to me, so I added some hexagons to my sign. My sister sent me this pic - I sent her a hello sign for her birthday. Looks great on her side table. And I made these two for my sister in law. 8 x 12 plywood. It doesn't really matter the kind. You can get different thickness and quality at Lowes or Homedepot. They are pretty big. You could really use any type of wood though. |1| Above is the piece of wood. 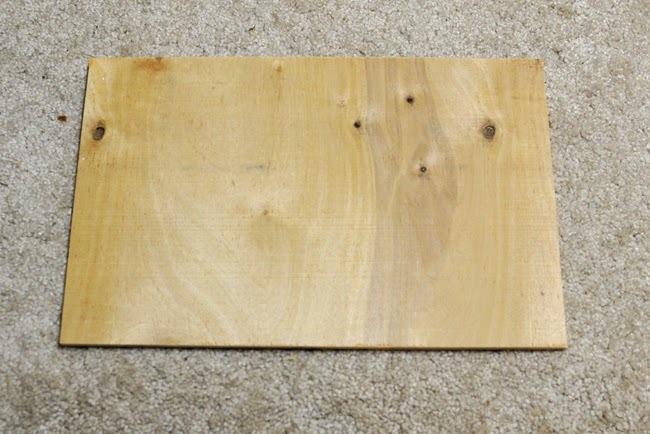 place your vinyl on the wood. I hate wasting vinyl and try to use as much of it as possible. 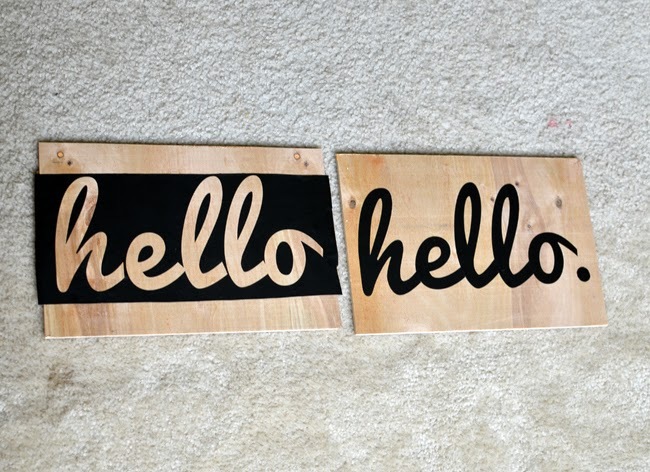 I actually cut three pieces of wood so I ended up making 3 signs with 1 cut out hello vinyl (please note the "I", husband showed me how and I did it completely without help and the lines are awesomely straight!). Place your vinyl on the board. 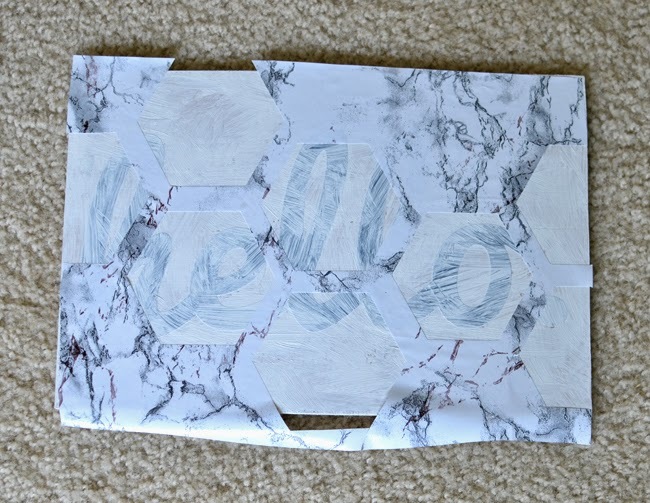 *note: the third hexagon hello sign was made after I had finished the first hexagon hello sign. After I had removed the vinyl from the finished first board I realized that it was still really sticky, so I put it on another board. |2| Paint background color of choice (I did white) all over the hello. For this part, Captain Awesome insisted on helping me. And a fine job he did. 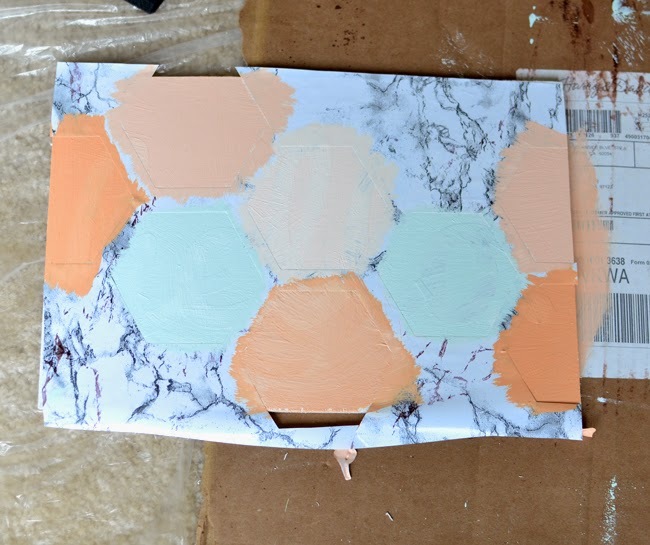 |3| After the white (background) paint dried, I placed the hexagon stencil on top. Again, I used ugly drawer liner that we had lying around. It was a little thinner than the vinyl, so I made sure to be extra careful when painting. But no worries, none of the paint leaked under the stencil. 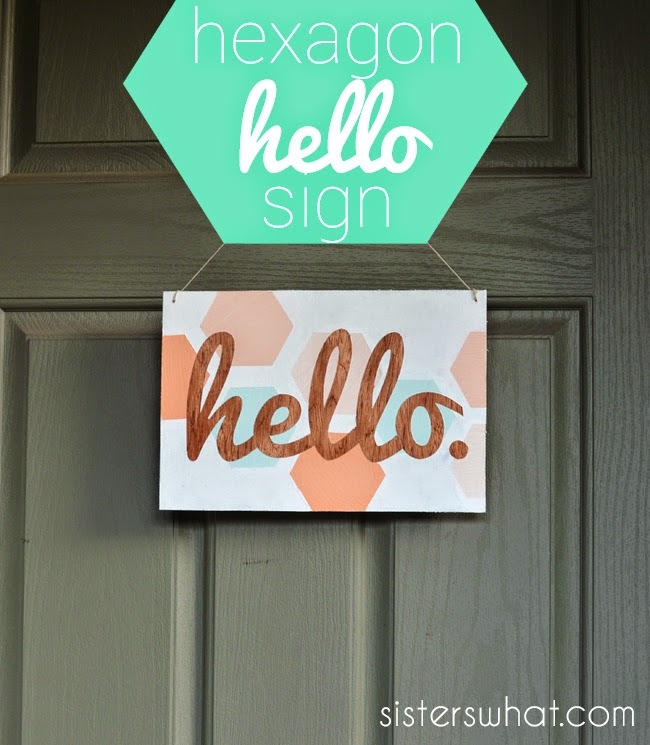 And that is how you make a hexagon hello sign. I let it dry and then drilled very small holes so that I could hang it on the door. 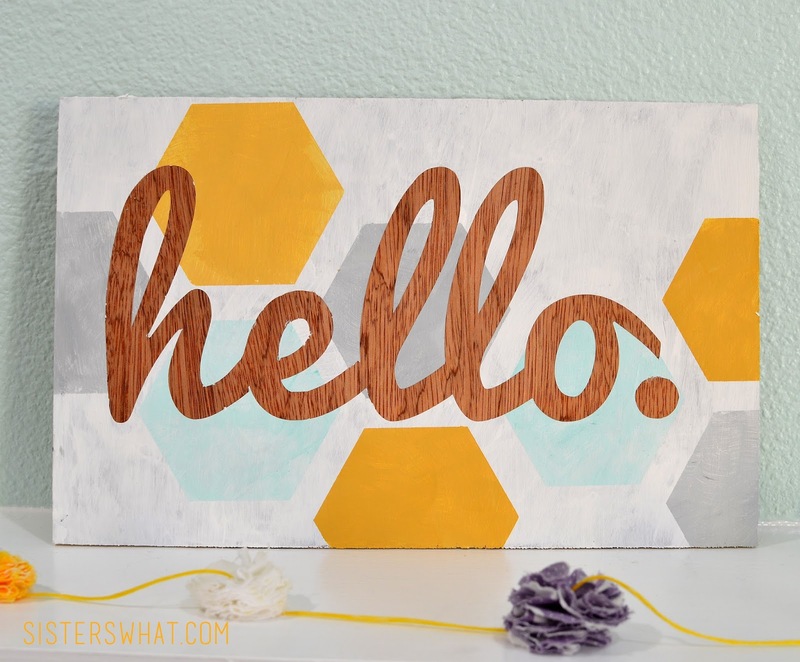 Now after I had taken of the hello vinyl from the sign above, I placed it onto another board and made another hexagon hello sign. Now for the hello sign above on the left, I painted white on the top of the stencil and mint on the hello letters. After the baste paint dried, I used painters tape to make triangle designs on top. This is so cute. I might try it myself! I love this so much! It is so cute! Love the one with the woodgrain showing through!!! I know! that's my favorite part! Oh these are my colors! Be sure to come share at our link party going on now, if you haven't. Hi Havalah! 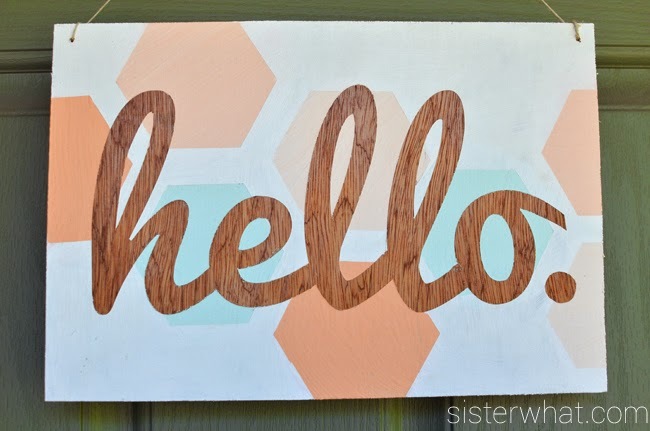 I just wanted to let you know that I LOVE your Hello Sign, and I'm featuring you as one of my Rockstars this week from Creativity Unleashed! 4. 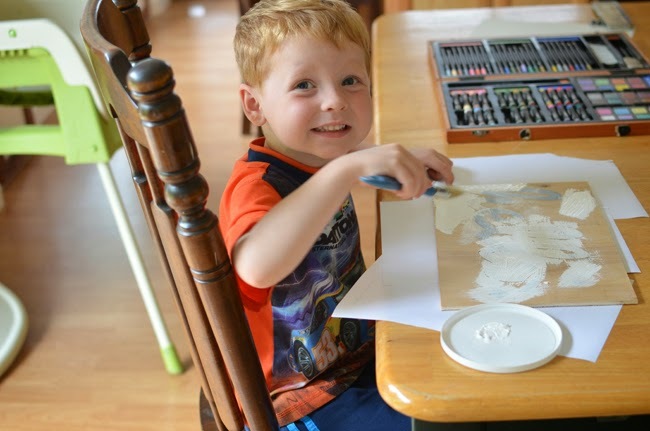 And a feature in my weekly newsletter! Oh thats really nice and friendly. Cute little project.